Remember this little project here? 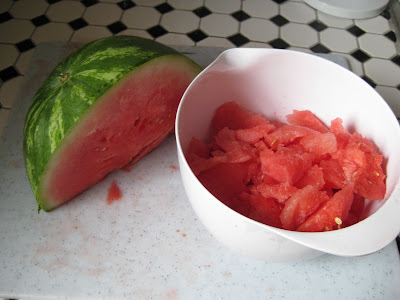 The watermelon being cut up. Actually it was just scooped out, it didn't matter what it looked like because it was just going to be blended. 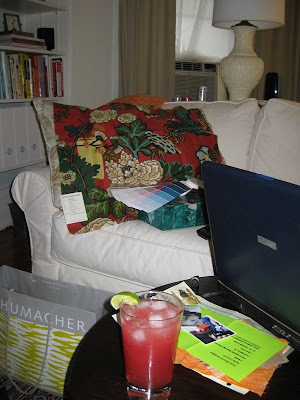 The most delish drink, the most delish fabric (more on that later), my computer, a paint deck and a pretty green malachite looking box I picked up shopping. It was a great weekend! Wash and dry the peppers. Pour the tequila into a glass container that can be covered. Put the whole peppers into the tequila, cover and set in a cool dark spot. We left 4 peppers in for about 2 weeks. They can be left for as little or as long as you like- again depending on how hot you want it. We like things on the very hot/very spicy end and ours had quite the kick to it. The BF said we could have left the peppers in for a little longer, I thought it was just perfect. 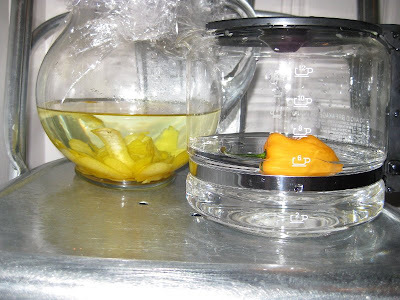 **there are lots of recipes out there for making infused tequila, some say cut the peppers and others say don't cut the peppers. We decided to just leave them whole and it worked out great. Although if you are in a rush to make this, cutting them might speed up the process BUT I would watch it very closely, those seeds are hotter than a mo'fo and could make things HOT HOT HOT. 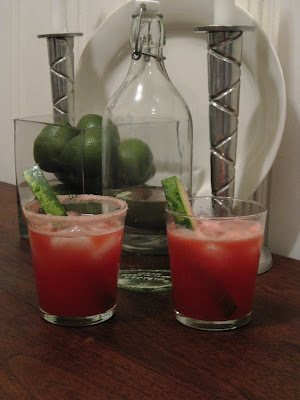 In a cocktail shaker, combine the lime syrup, watermelon puree, lime juice, tequila, orange-flavored liqueur, and ice. Shake until chilled. 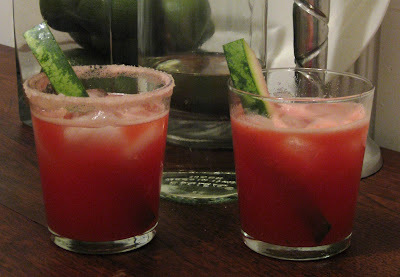 Strain into glass and garnish with a lime wedge, (it was hot out so we poured ours over ice). Makes 1 drink. Your coffee table looks like mine too! Computer, samples (mine has more seagrass/sisals with about 10 fabrics). LOVE the box, was it a thrifting find? Looks like my perfect weekend! Can't wait to see what's yet to come. Wish I had one of those drinks tonight! I am going to have to try these! How do you think jalapenos would do? I have 2 plants producing millions of jalapenos and running out of ideas for using them. I don't think I can handle the habaneros, but the margaritas sound like they would be delish with just regular tequila. I've been looking for a signature drink for our upcoming BBQ and this may be the one! These drinks sound super yummy. I must try them this coming up weekend. I can't wait to see what's inside the Schumacher bag. yum, yum and yum again! ok, i bookmarked the recipe for when i can drink again.. only 4.5 more months!!! hahah you need to come down for a party!!! I love that idea! A little kick of heat with your sweet! Yum!!! I'll have to see how long the infusion takes since I have two curious kittens who can get into *anything* given enough time! Oh I think this sounds AMAZING! Must try. Hubby's not yet convinced- that is fine. more for me! I'm impressed. Can't wait to see what you do with that fabric! my eyes went straight to that fabric....!! !